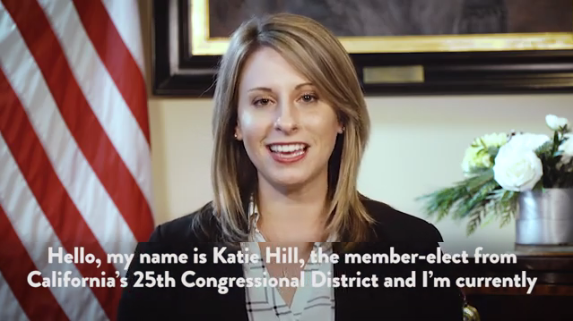 “Hello, my name is Katie Hill, the member-elect from California’s 25th Congressional District and I’m currently in D.C. for my second week of new member orientation. “In addition to learning where things are and how to use the tunnels, we’ve done a lot of talking this week about where we go from here, now that we officially have a House majority. As the majority and as Democrats, we know that before anything else can happen, we have to repair the trust between people and our government. “During this cycle, a record number of incoming freshmen refused Corporate PAC money – I was one of them. I did this because I wanted people to trust that at the end of the day, every decision I make and every vote I take is purely to benefit the people back home who gave me the opportunity to serve. That’s what government should be. “When we get dark money out of politics, clean up corruption and ensure fair elections, we will earn the trust of the public so they know that we are working for them, not special interests or corporations. “And with a system that works For The People, we will deliver policy outcomes that make life better for all of us: we will lower health care costs and out-of-control prices for prescription drugs. We will rebuild the United States’ infrastructure and put leverage back in the hands of workers and consumers. We will finally advance common-sense, bipartisan solutions to prevent gun violence. We will confront discrimination with the Equality Act , pass the Dream Act and take the first step toward comprehensive immigration reform. “Now more than ever, this Caucus is committed to delivering for real people across this great country. We’re changing the game and we’re doing it by prioritizing legislation like H.R.1. “I’m so excited to be a part of an incredible freshman class which is larger, younger and more diverse than ever before. Our class alone brought the median age of a Representative down by ten years and we have more women serving in the 116th Congress than in any previous session. “These demographic shifts are not a coincidence – they are a call to action. We were elected to office because we aren’t insiders – we’re actually representative of the public we’re representing. People want change and they want it now. We don’t have time for party in-fighting and we owe our communities reform, so they can once again trust in their government to deliver for them when they need it most. “I look forward to working together pass H.R.1, not just through the House, but to ensure our friends in the Senate know the stakes as well. Let’s get to work. Leader Pelosi. Still morning. Good morning, everyone. Thank you for being here. It’s quite an honor to be here with so many Members of our freshman class, this historic class, by dint of size, experience, enthusiasm, just diversity and the rest. Thank you. It’s been an exciting week. I’m just proud of saying three words ‑‑ majority, majority, majority. It has a nice ring to it, don’t you think? The American people gave us a Thanksgiving of hope, and we must act upon that charge that they have given us. They’ve asked the Congress to be a check and balance on the other branches of government. They, the public, are the ultimate check and balance. And we want to operate our Congress in a very open way, with transparency, of course, so they can see what is at hand here, that they can see our attempts at bipartisanship and that we are unifying in what we do. One of the issues that emerged in the campaign that the new class of House Democrats has as a priority is the integrity of government, as part of our For The People agenda. For The People: lower health care costs, bigger paychecks, integrity in government. For a while now, Congressman John Sarbanes of Maryland has been working on an initiative, H.R. 1, that was signed by so many of our candidates as the first order of business when we come here. The impact on that will be transformative to Congress when we reduce the role of money, amplify the voice of everyday Americans, so that they know that their voices matter. “America draws strength from our long, proud heritage as a nation of immigrants. In the Majority, Democrats will work to reverse the Republicans’ destructive anti-immigrant agenda. “Our House Democratic Majority will once again pass the Dream Act to end the uncertainty and fear inflicted on patriotic young men and women across the country. We will protect TPS recipients and those fleeing unimaginable violence. And we will hold the Trump Administration accountable for their inhuman policy of separating families, and the trauma and anguish they have inflicted on vulnerable children and families at our border. “Of course, we will meet our responsibility to provide strong, smart border security that serves our country’s needs, is consistent with our values, and doesn’t squander billions of dollars on a border wall. “VA has a solemn duty to ensure veterans receive the full benefits that they have earned and deserve. VA’s complete failure to uphold this responsibility or provide adequate solutions showcases the Trump Administration’s string of broken promises to students, veterans and their loved ones. “Ten years ago, Democrats restored the promise of a full, four-year college education for nearly 2 million Iraq and Afghanistan veterans and their families. Last year, Congress overwhelmingly expanded the GI Bill: improving benefits, closing eligibility gaps and increasing opportunities for Reservists, Guardsmen, Purple Heart recipients, surviving spouses and dependents. Yet today, a few weeks after Veterans Day, the gross negligence and shameful lack of accountability and oversight at VA continue to undermine these critical accomplishments and betray our promise to our nation’s veterans. On Wednesday, November 28th, Nancy Pelosi sent this letter to her colleagues asking for their votes for Speaker of the House. She won overwhelming support from her caucus and her nomination will be voted on when the 116th Congress convenes in January. Our responsibility is to ensure that the Freshman Class has every opportunity to succeed. This class of 2018 is an historic one by dint of its experience, its diversity and its commitment to deliver progress in the lives of hard-working Americans. Their impact will and must be transformative for the Congress and the Country. The American people voted for a check and balance on President Trump by sending a Democratic Majority to Washington. In order for us to honor that charge and engage the public, I suggest that our sessions on the House Floor be deemed America’s Town Hall meetings. As President Lincoln said, “public sentiment is everything.” The more open the Congress, the more the public will be engaged in our proceedings, and the better we can govern. I am grateful to so many Members of the 116th Congress for their support and ideas. We all agree that history is in a hurry, and we need to accelerate the pace of change in Congress. We have been blessed with a Democratic Caucus now enhanced by an historic Freshman Class. My responsibility is to recognize the myriad of talent and tools at our disposal to take us in to the future by showcasing the idealism, intellect and imagination of our Caucus. The public has entrusted us to save our democracy. It is our patriotic duty to deliver a more open, responsive, bipartisan and unifying government For The People. I respectfully ask for your vote for Speaker of the House of Representatives. Thank you for your leadership and friendship. Leader Pelosi. Good afternoon, everyone. And I do believe it is a good afternoon. We had most unifying session just now in the House Democratic Caucus. The new House Democratic Caucus, the most diverse Caucus ever, and it was so inspiring to hear my colleagues place my name in nomination, once again, for Speaker of the House. How moving it was to hear Joe Kennedy place the name in nomination, to be seconded by Kathy Castor, a colleague that has been the lead in climate change issues and the rest. Of course, Joe, a friend for many years, but a leader in the Congress, making his own mark. And then to have Joyce Beatty to speak in her own right, but to quote President Obama. It was very moving. The emotion demonstrated by my colleague, Adam Schiff, when he talked about leadership and the challenges facing our nation, was a joy to behold. And the new members, to have the new Members speak out with us now – Congresswoman Veronica Escobar, one of the new Members who spoke, and placing my name in nomination about our shared values. We are also joined by a Member who is very special to me, she is a new Member, a Member of this class, but she’s also a returning Member, Ann Kirkpatrick of Arizona, a woman of great courage, who voted for the Affordable Care Act, didn’t come back, said it was worth it and is here again. Thank you, Ann, for joining us. And, of course, nobody could ever have an honor quite like having this display of friends place my name in nomination than to have John Lewis be the – he wrapped it all up in such a beautiful way, not about me but about our challenges and about our need to be unified for the future. So I’m very, very – just so inspired by it all, and I’m so grateful to my colleagues for what they have done to place my name in nomination. Q: When you went to the White House that one time, you came back and you said, ‘Do women get to talk around here?’ How do you think President Trump is going to react to having to work with a woman in such position of power as you would hold as Speaker? Leader Pelosi. I will say this, when I was Speaker and President Bush was President, he treated me and the office I hold with great respect. He would jovially call me Number Three. He’s number one. The Vice President was number two. I was number three. He never began a meeting unless the Speaker was present. We worked together on many issues. I would expect nothing less than that from this President of the United States. We are a co-equal branch of government. My power there springs from the vote of the Members of the House of Representatives. I think that the President will be respectful of that. The legislation will likely face an uphill battle in the Senate, after Republicans maintained control of the chamber, picking up two seats. U.S. House of Representatives Democratic Leader Nancy Pelosi on Friday drew a tough line against a small band of Democrats opposing her planned return to the speaker’s job next year, saying she would not agree to step down early to win their support. “I don’t think…that they should be putting timelines on a woman speaker,” Pelosi told reporters in a Capitol hallway. Pelosi, 78, made history as the first woman speaker, holding the top spot from 2007 to 2011. With Democrats winning back a majority in the House in Nov. 6 elections, Pelosi is campaigning to return to the job and won the nomination in a 203-32 vote of House Democrats on Wednesday. She still must be elected by the full House on Jan. 3, when Democrats and Republicans will vote for speaker. She will need about 218 votes and probably will have to flip roughly 17 of the Democrats who opposed her. I’m with Nancy – “Majority, majority, majority” – it means being able to get back to work! Thanks, Jan! Good for Nancy—long may she reign! I like the way she stands up for herself. When I want to have pleasant dreams, I dream of Thing and Tuppence in orange jumpsuits and President Pelosi sitting at the Resolution Desk in the Oval Office. Voting is important. But abiding by the results of the election is equally important. And in WI, MI, and NC, it seems that’s not being done.